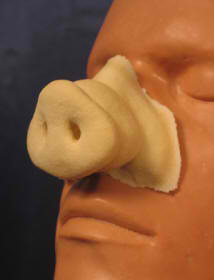 Our pig nose is made of soft foam latex. It is light-weight, strong and wrinkles like real skin. Our noses are designed and fabricated by Hollywood professionals and are very realistic. Since our noses have extremely thin edges, they can be seamlessly blended with your real skin. In addition, they can be reused if carefully removed with rubbing alcohol and powdered before placing them in a plastic bag. TIP: Use our pig nose for a Miss Piggy character. Attach your nose using prosthetic adhesive or spirit gum. Blend your nose into your real skin using our natural skin tones palette. You’ll also want a blond bombshell wig if you are creating a Miss Piggy costume. Our Foam Latex: Makeup Application Kit provides you with everything you’ll need to attach your nose, including the most common special effects colors. A wig is not included.